It’s not cool when a giant corporation uses unfair business practices to dominate a market, but other monopolies aren’t so bad. 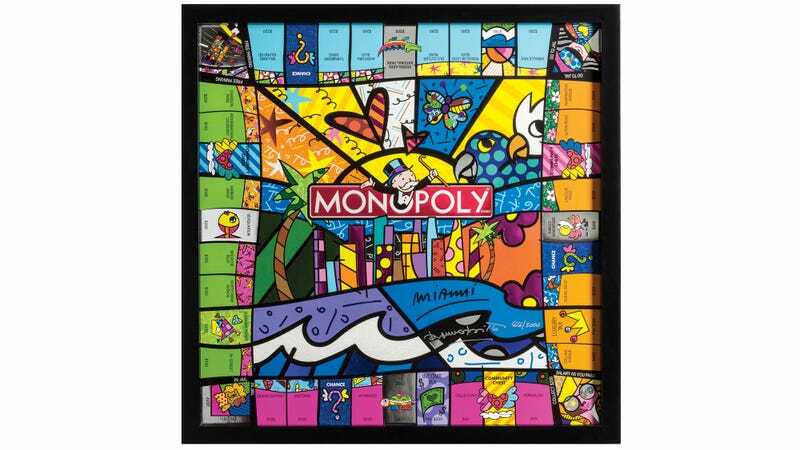 It’s surprisingly enjoyable to use a Monopoly to your advantage when playing the classic board game, particularly when the board features the vibrant bold artwork of Romero Britto. Winning Solutions is responsible for some of the most stunning versions of games like Scrabble and Monopoly you’ve ever seen, and the latest version of the classic real estate investment simulator was given a Miami makeover by pop artist Romero Britto. Instead of a folding cardboard game board, Monopoly Miami Edition comes in a two-inch deep over-sized wooden cabinet with a glass top sitting over its playing surface. Even the game’s six custom tokens, title cards, chance cards, and chest cards were all given a facelift by Britto. You won’t mind landing in jail when it looks like you’ve been incarcerated in an art gallery. Each set costs $500, so you’ll need to let every player know that tossing the game board into the air in a fit of rage is totally unacceptable, no matter how much rent they end up owing you.